Payton and her dad. The photo is from her aunt's fundraising site. If you’ve ever wanted to help someone, now is your chance. This story tugged at my heart like very few do. There’s a beautiful little four-year-old girl and her family in Lower Sackville, Nova Scotia that need our help. 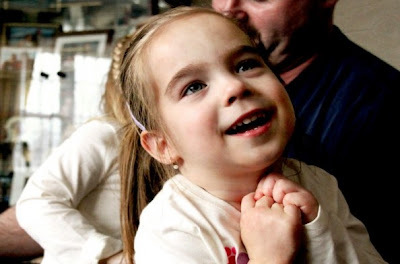 Payton Given has spastic cerebral palsy. Not that the disease is enough, but she also recently lost her mother – Amy – to a blood disorder less than a year ago. Amy was 34. When Amy died she left behind her husband, Brad, an older daughter and a set of four-year-old triplets. Payton is one of the triplets. The family had no life insurance. As you can imagine they are under significant financial strain from both Amy’s illness and Payton’s condition. Can you imagine – a father having to say that. I know that her father would never say she is a burden but he must feel terribly alone. This feeling must be overwhelming having to be borne without the love and support of Amy. It’s heart wrenching. The Given family was originally told by some local service organizations that Payton was too young to receive a wheelchair. 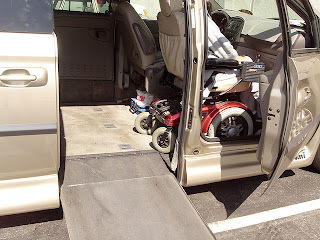 They are expensive, and adding financial strain is the expense of retrofitting the family van to accommodate the chair. Given, a proud man as any of us would be, was reluctant to ask for help. But putting the welfare of his daughter first, he has reached out. The chair and van retrofit will cost about $60,000. People have been amazingly generous, but the goal hasn’t been reached yet. One child even sold his Halloween candy to donate the money. There is also a fundraiser auction in Lower Sackville on November 24. It is to be held at 300 Sackville Drive at the Sackville Super Bowl. Viewing will be at 6pm and the auction at 7pm. They are accepting donations of goods to be auctioned. Nice Darrell. I think they are well on their way. It's so nice to see how the community has pulled together. I think she'll get a chair soon!